Today's Image of Mars shows Mars Exploration Rover Opportunity's discarded lander, the Challenger Memorial Station, at Meridiani Planum. This image is a mosaic of 12 images taken by the rover's panoramic camera on Sol 24 of Opportunity's mission. The mission is now approaching its 8 year anniversary (Jan 25 2012) since landing on Mars. The rover has continued operations much longer than the 90 day mission it was intended for. Clicking on this image will take you to the original high definition image from NASA. 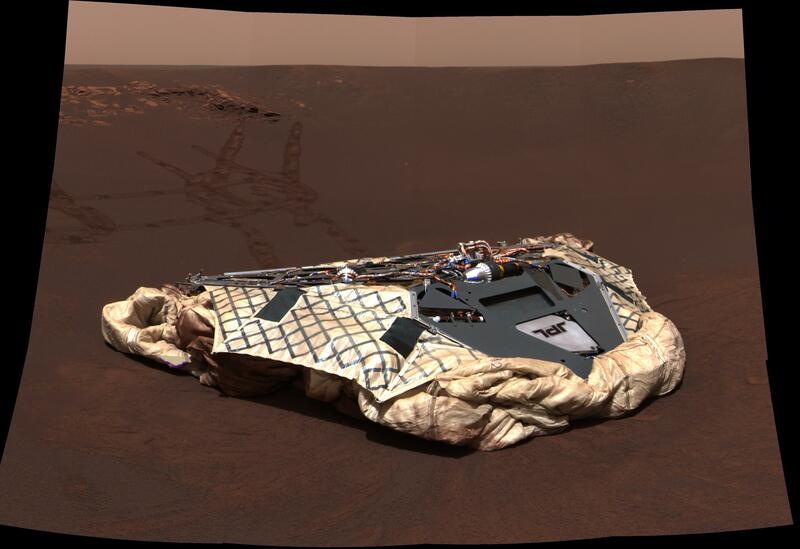 To see updates on Mars Exploration Rover Opportunity I highly recommend reading Stuart Atkinson's blog on the rover, The Road to Endeavour. Win a 2012 HiRISE Calendar!